On September 18, DRC’s president Joseph Kabila – shortly before heading off to the 69th session of the UN general assembly – finally announced a major round of rotations with the Forces Armés de la République Démocratique du Congo (FARDC), the country’s national army. This reshuffle features a few remarkable changes, both in personnel and in hierarchy. While certain observers identify this reform as a move to tighten Kabila’s (or his entourage’s) grip on the country’s security forces, assessments should remain cautious for many consequences of the reshuffle remaining unclear at this point. According to Jean-Jacques Wondo, a Brussels-based Congolese military analyst and ‘Forum des As’, a national newspaper from Kinshasa, the new army command structure may look like this (the link includes a more detailed list, while Wondo’s graph below shows the key parts). Wondo again, has already given very poignant analyses on how this will affect DRC’s security architecture, but perhaps to be taken with a pinch of salt at this time. Despite certain paths of interpretation, it is a bit early to interpret the reshuffle in light of the upcoming electoral cycle. Structurally, the creation of so-called ‘zones de défense’ is the most striking element. 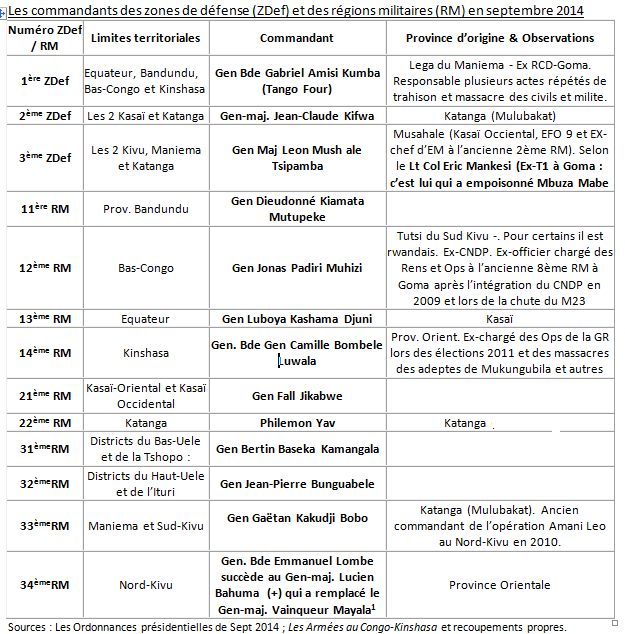 Over the past years, FARDC has been organised through the following hierarchical layers: An ‘état-major général’ presiding over the ‘état-major’ for land, aerial, and naval forces. Next, on a provincial level, the so-called ‘régions militaires’ (more or less equivalent to a division) also had their ‘état-major’ and commanded (since the regimentation process) over sectors, regiments, and battalions (before regimentation, there were still brigades). All these technical military terms should be taken with a pinch of salt as well for them not strictly representing standardised international military categories in all cases. In addition, the presence of several ‘operations’ units as well as the shifting deployment of commandos and republican guards is hard to trace and difficult to localise in the hierarchy and command structure. With this reform, three defence zones are interposed between the national staffs and the military regions, the latter also being slightly modified and not exactly corresponding to current provincial limitations as before. The electoral arguments does not really hold in terms of strategic cause for these structural changes and nor does the patrimonial one that suggests power balancing as a political survival strategy – all that could be achieved with other measures or the positioning of key figures as well. Looking at the personnel, a few broader observations are interesting: Many Northern Katangans have been put into key functions (Banza, Yav, Yav, Kifwa, Sikabwe, Kakudji etc.) and generally, there is an eastern overweight at the helm of FARDC (Amisi, Amuli, Mushale, Padiri, Nakabaka, Nabyolwa etc), including some ex-RCD and ex-CNDP generals. However, this is no news in FARDC. Most remaining ‘loyalist’ ex-rebels – are they have become fewer since M23 – have been rewarded adequate functions in the army. Among the integrated commanders and together with the old guard trained in professional military academies (EFO and ERM) they belong to the best-trained senior military stuff in the country. The most notable absence is John Numbi, former military general and national police commander accused of having ordered the assassination of human rights activist Floribert Chebeya. Looking at the ‘bigshots’ within FARDC, there is a few interesting ‘promotions’. Lt.-Gen. Didier Etumba stays on as chef d’état major général – despite cyclical accusation he is playing a double game and as one of the few high-level commanders from the west. From now, he will be assisted by Maj.-Gen. Dieudonné Amuli, former army commander for Ituri and head of Amani Leo operations (Amuli allegedly worked by Bosco Ntaganda, which he always refused) now taking the positions of operations and intelligence (‘ops-rens’). Maj.-Gen. Celestin Mbala is losing is cabinet position as the President’s personal chief of staff and becomes another deputy responsible for administration and logistics (‘admin-log’) in the état major général – one of the clearest degradations or a deliberate strategy of Kabila’s to have a close associate to keep Etumba in check. In the second layer of the overall staff command, Maj.-Gen. Prosper Nabyolwa from South Kivu, an ex-FAZ and former Kinshasa FARDC commander and head of MICOPAX (CAR) is the most prominent figure. The (interim) commander of land forces and inspector-general Lt.-Gen. François Olenga will move to the cabinet as Kabila’s chief of staff. New land forces commander will be assumed by Dieudonné Banza who used to be head of the republican guard. To which extent these represent promotions of degradations is very hard to tell since they switch from key positions to other key positions and almost exchange hats amongst each other (the personal chief of staff of the President is often indirectly implicated in commanding the republican guard). Banza will be assisted by Maj.-Gen. Vainqueur Mayala for ops-rens. Mayala’s origins are in the west, his last assignment being the 2nd military region in Bas-Congo after he was moved from North Kivu due to his defeat against M23. Mbuayama Nsiona, the former commander of the 6th military region in Katanga becomes new head of the naval forces while the airforce is led by Enock Lumbi, a rather unknown Brig.-Gen. of the FARDC. The defence zones will be led by Maj.-Gen. Jean-Claude Kifwa (southeast, previously Orientale province), Maj.-Gen. Léon Mushale (northeast), and Maj.-Gen. Gabriel Amisi (west, after having been cleared of arms trade accusations and led DRC’s second football club AS Vita to new success). Kifwa has repeatedly been accused of colluding with actors such as the late Paul Sadala of Mayi Mayi Morgan or other militias. While he is trusted by Kabila (obvious given his new assignment including Katanga), he counts as a more dubious figure in the army. Mushale takes over the defence zone in a considerable career jump as he used to be T1 of the 9th military region under Kifwa. Kifwa himself, is now assisted by another Katangan army heavyweight, Maj.-Gen. Sylvain Nawej as an admin-log. Easy to be overlooked, but nonetheless key changes are the following. Maj.-Gen. Patrick Masunzu, long-serving South Kivu 10th military region commander will be responsible for the Kalemie area in North Katanga. Brig.-Gen. Delphin Kahimbi joins the état major général for deputy ops-rens and may therefore leave the military coordination of DDR activities. Brig.-Gen. Fall Sikabwe, a Katangan who worked in Ituri operations (against Mayi Mayi Morgan, among others) is promoted head of the new 21st military region, the 22nd military region will be led by Brig.-Gen. Philémon Yav, another Katangan officer. Notable ex-rebels include Brig.-Gen. Jonas Padiri (ex-RCD), Brig.-Gen. Nakabaka (ex-RCD), Brig.-Gen. Eric Ruohimbere (ex-CNDP), Brig.-Gen. Innocent Kabundi (ex-CNDP). Without going in too much detail, the reshuffle shows one clear trend: Impunity is still not addressed within the Congolese army. With media talking about Amisi Tango Four’s return, he is becoming a scapegoat for far over a dozen generals who have now been (re-)assigned lucrative and influential positions. Further, and looking at previous reshuffles, the move represents another round of balancing out rival factions and and diverging power poles as well as satisfying demands and contracting loyalties. While this happens about 2 years before schedule national elections, it does not need to have a specific link to the latter – any army reshuffle would have attempted to consolidate control, cultivate divide-and-rule strategies and tighten the grip over the security apparatus. Whether or not elections – Kabila and his entourage, e.g. security adviser Pierre Lumbi, are genuinely interested in keeping potential unrest low. Against this backdrop, the two most important questions not answered by the preliminary deployment tables are the sort of General John Numbi and the vacant leadership of the republican guard. Unlikely that Numbi ends up being rehabilitated with such a key post but given his strong military and Katangan powerbase, we will obviously see him coming back sooner or later. Then for the republican guard, it depends if Kabila has enough trust in letting Olenga become a de facto commander or whether Banza maintains operational responsibility. In addition, there is a few alternatives among Kinshasa-based generals who could become shadow commanders of these special forces. This is an interesting article. However, it contains one factual error: Brig-Gen Fall Sikabwe is wrongly presented as a Northern Katangan. He was born and grew up in Katanga but he is Mubembe from South-Kivu. Reblogged this on finding development. Gen. Olenga was the general inspector until his promotion….. AND had a second job since Nov 2012 to be the CHef de Force de terrestre INTERIM ..